TeamViewer 11 is the latest version of the popular remote desktop application. The new version ships with 16 new features that improve performance, quality and other features of the program. The team focused on three core areas in the release: user experience, more use cases and support for more devices. The user experience has been improved in many different ways. Performance is one of the biggest changes in TeamViewer 11. According to the development team, TeamViewer 11 has been optimized to use up-to 30% less data, increase file transfers up-to the factor 15, and provide better image quality during remote sessions. The bandwidth reduction helps users who use TeamViewer in locations with low-bandwidth and unreliable Internet connections. You may also notice the new user interface that TeamViewer 11 ships with, improvements made to the toolbar that features access to the tools needed to use TeamViewer effectively, and support for the latest operating systems including Windows 10, iOS 9 and Mac OSX El Capitan. As far as use case improvements are concerned, there are several feature additions integrated in TeamViewer 11 as well. The TeamViewer chat is integrated in the management console for instance, and it is also available on mobile devices running iOS or Android operating systems. A new SOS help button can be added to user systems which acts as a quick support module allowing customers to request assistance with a click on the icon afterwards. You will be notified about the request and can respond to it accordingly. A new quick feedback button can be integrated with the SOS request that provides customers with an option to rate and comment on the assistance. TeamViewer 11 furthermore enables you to allocate TeamViewer channels to specific users in a company. On the devices side, TeamViewer 11 ships with support for Google ChromeBooks, headless Linux servers, and unattended Android devices. The latter is not just limited to mobile devices but also to other devices running Android such as ATMs, household items or wind turbines. 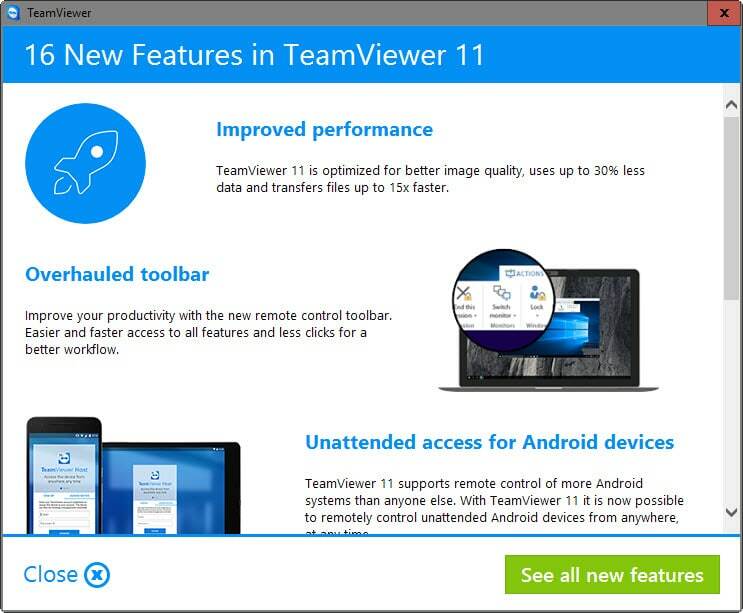 TeamViewer 11 is available for download on the official TeamViewer website. There you find additional information about the new features it ships with, as well as several videos introducing those features. Now You: Are you using TeamViewer? What's your take on the update? Ghacks needs you. You can find out how to support us here or support the site directly by becoming a Patreon. Thank you for being a Ghacks reader. The post TeamViewer 11 ships with a host of new features and improvements appeared first on gHacks Technology News.